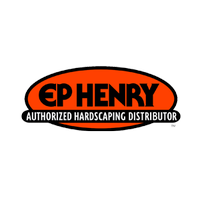 Many of our customers have used E. P. Henry concrete wall stones, but we also can use Techo-Bloc, Cambridge, Belgard, Anchor, Hanover, Rinox, CST or any other brand of wall stones. 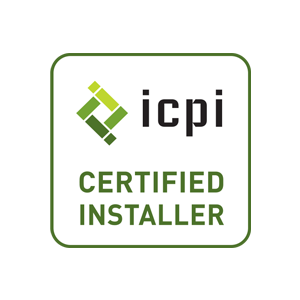 Installation is the same for all of the different brands. 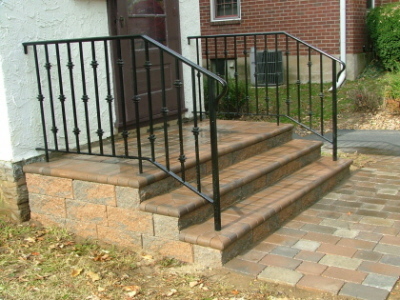 E. P. Henry Stone Wall Select (or Diamond Pro which is the same size) can be used to make steps with risers up to 8-inches high, that look very nice with E. P. Henry interlocking concrete pavers. Because of its size and weight I believe Stone Wall Select or Diamond Pro are the best choice on this page. 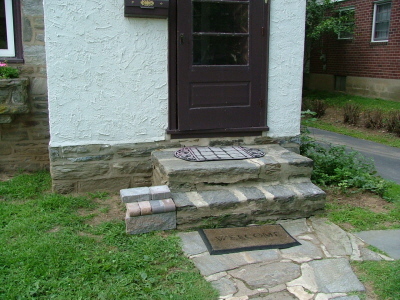 E. P. Henry Terrace wall stone can be used for steps with riser up to 6-inches high. E. P. Henry Coventry wall stone can be used for steps with various riser heights. 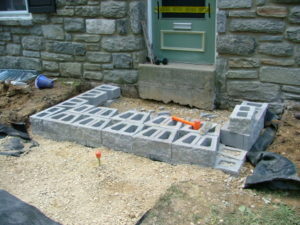 Steps are constructed on a base of compacted crushed stone, but do not require a concrete foundation so they are more economical than masonry (brick or flagstone) steps. 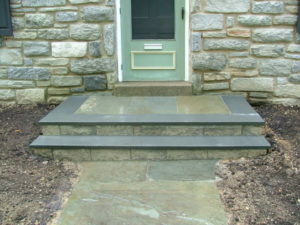 Treads for steps can be constructed with Bluestone, Flagstone, or man-made caps or bullnose pavers of various colors. All steps shown were constructed by Robert J. Kleinberg Landscape Design and Construction using E P Henry Wall Stones. E. P. Henry Stone Wall Select (or Diamond Pro which is the same size) comes 8-inches high, 18-inches long and is 12-inches deep. 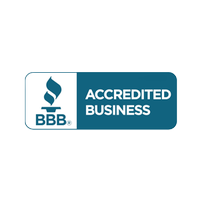 Because of its size and weight I believe Stone Wall Select or Diamond Pro are the best choice on this page. 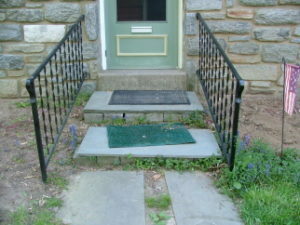 It must be set on a compacted stone base and two layers are necessary for proper stability of steps. 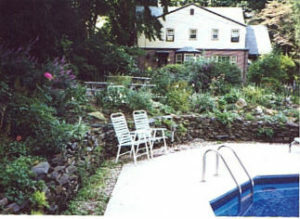 Stone Wall Select comes in four colors: Gray, Autumn Blend (red and gray mix), Tan and Brown. Steps can be capped with either 4-inch thick Stone Wall Select Caps or Bullnose pavers in a variety of different colors. E. P. Henry Terrace Wall comes 6-inches high, 16-inches long and is 12-inches deep. 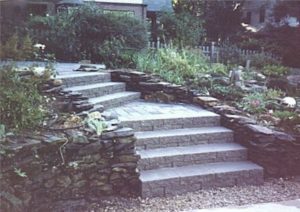 It must be set on a compacted stone base and two layers are necessary for proper stability of steps.. Terrace Wall comes in four colors: Autumn Blend (red and gray mix), Pewter Blend, Harvest Blend (brown blend) and Dakota Blend (gray and brown mix). 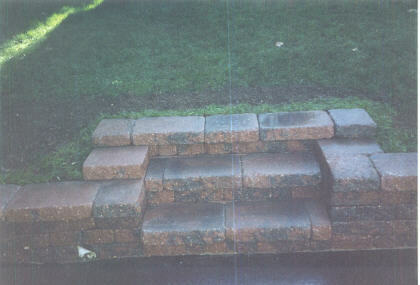 Steps can be capped with either 3-inch thick Terrace Wall Caps or Bullnose pavers in a variety of different colors. Steps are constructed on a 6-inch base of compacted crushed stone, and at least 8-inches of wall stones below grade. 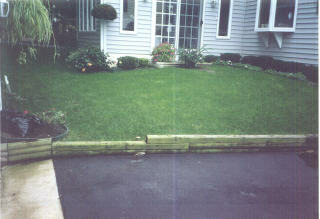 Flagstone treads are installed with Segmental retaining wall adhesive. E. P. Henry Coventry Wall comes in two heights and a variety of lengths, that help give it the look of natural stone. It is 8-inches deep. 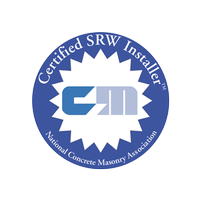 It must be set on a compacted stone base and each layer is connected to the next by pins that automatically give each wall the proper batter. For steps the pins are turned around for steps that go straight up without batter. Coventry Wall comes in four colors: Autumn Blend (red and gray mix), Pewter Blend, Harvest Blend (brown blend) and Dakota Blend (gray and brown mix). Steps can be capped with either 3-inch thick Coventry Caps or Bullnose pavers in a variety of different colors.